I have been happily combining traditional layouts with Project Life style pages for the past two years. After having spent a few years attempting two separate albums-one a traditional album and one a Project Life album-I finally found my sweet spot by combining the two. However, just because I have found my groove, it doesn't mean I am without my struggles. 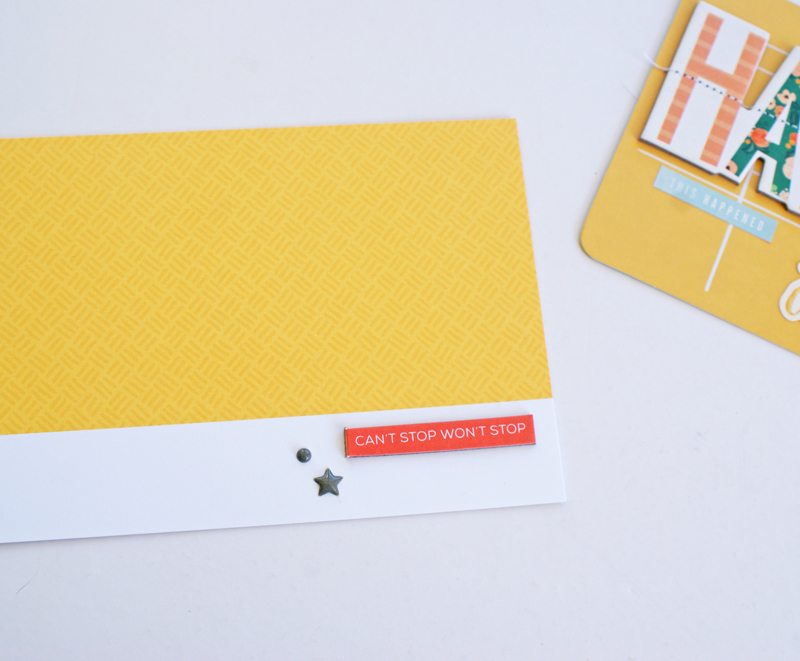 Today I want to talk to you about my biggest one--4 x 6 cards. The problem I have with finding 4x6 cards to use, is that I don't have very many to find! With my sub to Studio Calico's PL Kit and my design work with Gossamer Blue, I get only a handful of 4x6 cards. Then throw in the fact that I am a little (too) picky about which ones I choose, I am left with only a few to use. Now the obvious and easiest solution would be to just buy more, but I have tried this and it does not work at all for me for the following reasons: I like variety and I am not to keen on repeating cards; I really don't have a whole lot space to store any of the PL core kits; I feel like it's too wasteful to buy more cards when I already have so much product at home--certainly I could make my own out of what I have right? So what I have been doing recently to sort of tackle this problem is pull from what I already have and to keep a little bit more of an open mind about those cards that don't spark a whole lot of excitement for me. These three cards range from the simply altered to completely made over. This first card began with a completely blank canvas. The card is designed with lines to include journaling and that's why I skipped over using it--I rarely (maybe never) write on larger cards. However, when I went back for a second look I decided I could use it as a background and went to town with some stickers, chipboard, and sewing. 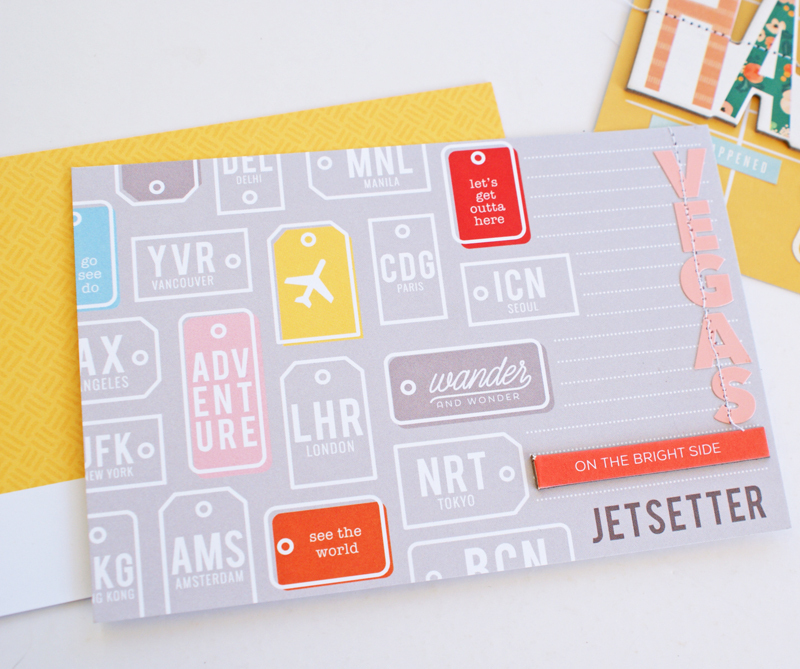 The initial reason I skipped over this next card is that we didn't fly to Las Vegas-I drove there-which meant the "Jetsetter" sentiment didn't really apply to me (despite the fact that I have to drive really fast to stay alive on the way there). 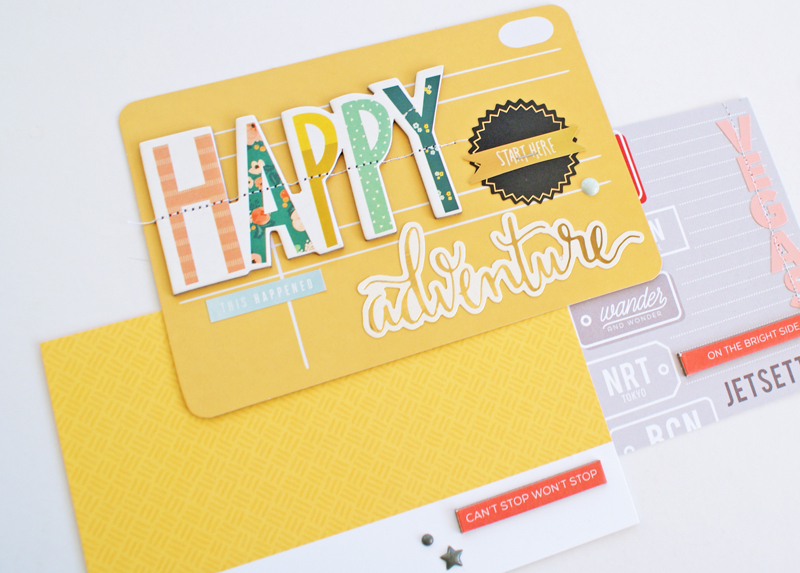 As I was working on the page for this set of photos though, this card and it's colors went really well, so I decided to look beyond "Jetsetter" and saw "adventure," "let's get outta here,", and "wander." All of a sudden this card made perfect sense and with a little embellishing I had a card I was super happy about. This last card really embodies my true PL style-simplicity. Ironically, the the card itself was a little too simple so I jazzed it up a bit with a chipboard sentiment and enamel dots. In my dream world, I have lots of 4x6 cards that are ready to slip into pockets, but until that becomes a reality I am just going to have to make what I do have work for me. 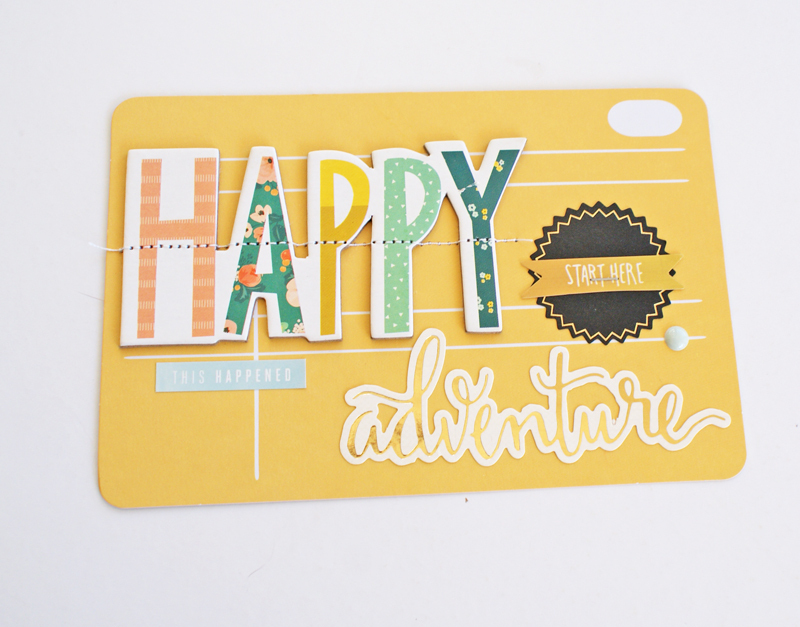 Your embellished cards look great, Michelle, and looking forward to seeing them in use!